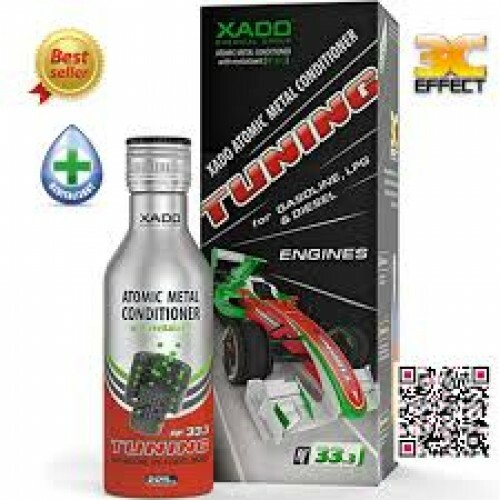 XADO Tuning Atomic Metal Conditioner is an engine treatment that rebuilds metal. One bottle of Tuning Atomic Metal Conditioner contains enough Revitalizant for 33% (RF33) of a complete cycle of revitalization for an automobile engine. The difference between this product and 1 Stage Maximum Atomic Metal Conditioner is this product contains 1/3 of the raw, active ingredient – Revitalizant - that Maximum contains. Tuning was created for high-compression or modified automobiles that may not require a complete 100RF revitalization cycle at once. This product can also be used in normal automobiles as some prefer to Revitalize their engines slowly by using three (3) bottles of Tuning Atomic Metal Conditioner instead of one 225ml bottle of 1 Stage Maximum Atomic Metal Conditioner. This treatment works in gasoline-powered, diesel-powered, and natural-gas powered engines. No matter how well a car is maintained, high heat and friction cause a car’s engine to become worn, scratched, and misshapen over time. Adding XADO Tuning Atomic Metal Conditioner to your engine oil rebuilds worn engine metal and coats the rebuilt metal at the friction points with a self-regulating layer of ceramic-metal to prevent future wear. Unlike other engine treatments that must be added during every oil change, a complete cycle of revitalization with XADO Tuning Atomic Metal Conditioner will protect for 62,000 miles. XADO’s innovative patented nano-technology is the result of 20 years of research and development. When added to an automobile’s engine oil, Revitalizant rebuilds engine metal at the atomic level, reversing wear, restoring engine geometry, and adding a self-regulating layer of ceramic-metal protection to prevent future wear. XADO Revitalizant does not cake, flake, or alter oil viscosity. This makes it safe to use in even the most sensitive vehicles. XADO’s Revitalizant technology has been independently tested and proven to work. Revitalizant is unlike any other engine treatment, because it actually works to rebuild metal, targeting the source of engine wear instead of merely masking the symptoms. Revitalizant – the active ingredient that rebuilds metal – is activated by high-heat and friction, so it only repairs metal at high friction points where metal wear occurs. Revitalizant leaves crank-cases and non-friction metal unaffected.